This retreat is Doron Yoga and Zen Center’s signature program. It is designed to guide you in taking the first steps towards building lasting joy into your everyday life. By taking yogic lessons away from the yoga mat and into the real world, you can learn to approach life in a healthy, holistic manner. The course focuses on practicing four major pillars of a balanced lifestyle - physical yoga, breath and energy, food and nutrition, and training the mind. The rooms at the Doron Yoga and Zen Center are simple but beautiful. Rustic, yet charming, many rooms have either a jungle, garden, or lake view. All accommodations are new, and are built for comfort and safety while being ecological. Their showers have hot water, and they have western toilets (eco treatment). The water source is from a spring supplied by the municipality and from river water that runs through the property. They have three private rooms with shared bathrooms. These rooms are unique and have their own painted wall murals, and other special art and decorations. There are three toilets, two showers, and two sinks, separate from one another, so there is never wait time. There are two lovely and spacious dormitories, which sleep five to six people and share the bathroom area. They have nice mattresses with traditional Mayan coverings, nightstands, shelves and other storage places. They have a cozy, artsy feeling. There are also three beautiful log cabin rooms. These rooms have en-suite bathrooms, a deck with hammocks and chairs, gardens and beautiful lake view. These rooms have skylights and a peaceful, creative energy. Bathrooms have locally sourced slate for the showers, hand carved mirrors, bamboo and wood elements. They feature local hand-crafted furniture and orthopedic beds. Led by the author of The Yoga Lifestyle, Doron Hanoch, you will be encouraged to explore the negative patterns that are holding you back from integrating these healthy habits into your life. In addition to daily pranayama, Zen meditation, and yoga asana practice, the program will include afternoon workshops on specialized topics such as Ayurveda, nutrition, and Zen mindfulness. Finally give your body and mind the attention they deserve. 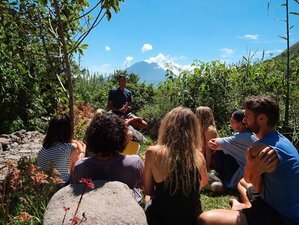 Spend a week living among the abundant natural beauty of Lake Atitlan, eating homemade vegetarian food, and enjoying the company of a supportive yoga family. This retreat is a perfect a way to reset from the stress of your everyday life, and provides practical steps to move forward with a new perspective of joy and gratitude. The Doron yoga method (based in Ashtanga from primary through third series) mixes Yin and Yang, core work and strengthening, with deep stretching. The class offers a challenge and movements, but the flow is slow, mindful, and focused. You will work hard, and laugh at the same time. There are lots of tips and teachings that will help you advance rapidly. Doron Yoga is a sustainable yoga system, where safety comes first and foundations of correct alignment specifically for each individual. Then, based on that they build up to the most advanced practices according to each student’s level and needs. Receive amazing hands-on assists from a loving, compassionate, enthusiastic, and energetic teacher with more than 25 years of yoga practice and studies around the world. Your days begin with pranayama (breathing practices), meditation, and yoga asana. This practice, which lasts a total of 2.5 hours, is the perfect way to start your day from a place of bliss. Practice is followed by a yummy, nutritious, super food breakfast. You then get a break to relax, read or go explore. Doron Yoga is happy to help with arranging activities such as stand up paddle, massage, market visits, Volcano hikes, and more. It is also fun to just sit on your hammock, relax by the river on the property, or chat with new friends. It is also an easy walk to the lake, where you can enjoy swimming or sitting on the dock by the water. In the afternoons, you will deepen yoga practice, dance, sing, and play. We will soften into yin, relax into yoga nidra and understand better how to make resolutions actually work. Doron will guide you through meditations and intentions setting, that will actually help you reach your goals. Prepare to laugh, dance, practice some powerful yet loving yoga, focus your mind like a Jedi, and love yourself and others like never before! This inspiring workshops, which are an opportunity to dive deeper into the practice, gain more knowledge from an expert leader, and have time to ask specific questions. Learning your body type (dosha) and what it means. How to balance your specific dosha, what are your strengths and where do you tend to slip. This is a very empowering session where you will comprehend how to not only balance your health, but even relationships and communication in life. Morning routine - tongue scraping, oil pulling, nauli, and more. Night routine - intermittent fasting. Sleep habits. Intentions versus resolutions, gratitude meditation. What to eat and drink according to your body type, using a variety of systems - Ayurveda, raw food, macrobiotics, the flexitarian method, and new diet researches. Understand what are nightshades, should you eat raw food, fermented food, or soy. Which dairy is better? Learn about dairy substitutes, oils that heal, and the most important veggies in your diet. You will also learn about some basic recipes and many cooking tips that are practical and quick for you to improve your eating habits in an easy way. Q&A regarding your poses and practice, when to practice, how much to practice, what kind of practice for your dosha, alignment, and some of Doron’s special secrets to make your practice shine. How does your mind influence your happiness? Tips regarding meditation, walking meditation, improving how your mind functions during the day, and how to use it have a blissful life. Doron is a certified 550-hour yoga teacher (ERYT) as well as the director of the Doron Yoga School (RYS 200 and 500) and founder of the Doron Yoga and Zen Center in Guatemala. He is the author of The Yoga Lifestyle (LLewellynn, June 2016). Doron was introduced to yoga and meditation in 1992 while traveling and studying in the Far East for two years. During that time, Doron studied at the Osho Ashram, with the Dalai Lama in Dharamsala, in Thailand doing Vipassana retreats, and in Japan living and working with a Buddhist priest. Doron Yoga and Zen Center is a spiritual eco village, based on permaculture principles with touches of Zen. It manifests the power and energy of the magnificent Lake Atitlan. The lake can be majestically viewed from the grounds, with volcanoes and local villages perfectly framing the scene. They are part of the Maya village of Tzununa in Guatemala. Located seven-minute walk from the lake, you can enjoy hammocks hang by the river and gardens, and connecting paths are all paved with local stone. Doron Yoga and Zen Center may have one of the most beautiful yoga spaces in the world, consisting of a sprawling cypress floating floor, surrounded by large glass sliding doors, held up by huge bamboo pillars, and featuring jaw-dropping views. High ceilings with extra insulation keep the temperatures perfect year round. It is a temple sitting along the Tzununa River, allowing for the sound of water to flow softly and soothingly into your practice. Unlike many ashrams, they did not cut corners, and you can see the beauty in the details. The place is kept very clean and has a wonderful vibe to it. The cane, Cyprus, pine, and rocks used in the construction are locally sourced, where local community workers built each house with care. Permaculture principles are followed to ecologically enhance the quality of the construction, garden, and design functionality of the center. The Buddha café is a wonderful meeting place. It hosts a large deck with a variety of seating options and a gorgeous view of the lake. It serves super nutritious, delicious gourmet, vegetarian food. One of its primary highlights is the great company. Travelers meet to share stories, experiences, a cup of tea, and a hug. It offers a place to rest, connect with new friends, read, and have some delicious food. Permaculture principles are followed to ecologically enhance the quality of the construction, and design functionality of the center. They grow coffee, bananas, avocados, lettuces, beans, yams, radishes, herbs, and around 30 other fruits and vegetables (yum, guacamole!). They have a beautiful fire pit under the grand Jocote tree (which you may want to climb). Additionally, they have built a natural, large, ceremonial-grade sauna to help with detoxing and cleansing. They offer massages and can organize tours around the lake for you. The Doron Yoga and Zen Center was built on a high-frequency vibration land. They are sure you will feel it as you come stay with them. As one guest stated: “center” doesn’t seem to be the most fitting word - maybe something like dream village, or yoga farm, or riverbank Zen oasis. Three vegetarian meals will be served each day with a mix of international, Guatemalan, and Doron’s special healthy, yummy, and Mediterranean touch. These are made from fresh local produce, organic when available. Gluten-free and vegan diets can be accommodated upon request. Each meal is substantial, varied, and nourishing, to energize you through your practices, without leaving you feeling too heavy. All food at the Doron Yoga and Zen Center is prepared as healthily and nutritiously as possible, under the guidance of the founder and director, who is also a trained chef and certified nutrition consultant. To the greatest extent possible, food is organic and locally sourced, including from their own blossoming gardens. You will get a great balance of raw food, cooked food (with healthy oils), fermented foods, healthy sauces and condiments, homemade jams and peanut butter, fresh homemade granola, baked sourdough bread, fresh made tortillas on wood oven, pizza from their clay and wood burning pizza oven and so much more. They offer snacks and drinks for a pick-me-up or dessert. Try their chocolate chip banana muffins, vegan power super food rich bliss balls (made with local Mayan raw cacao), vegan black bean brownies, or one of their drinks: kombucha or probiotic ginger. Be mindful of food and water hygiene, as travelers’ diarrhea is not uncommon in Guatemala. This can be quite challenging when embarking on a yoga program. Bring some grapefruit seed extract and for daily maintenance, add of seven to eight drops in water or juice. Remember to bring along any other supplement that helps soothe your tummy. Please book your flight to arrive at La Aurora International Airport (GUA) or Antigua. Doron Yoga and Zen Center can also arrange a private / shared shuttle for you at an additional cost. It takes a bit longer as they go around the top of the lake, but on the other hand you get into one shuttle all the way here. If you chose shared shuttle from the airport to Panajachel (30 USD), Doron Yoga and Zen Center will help you arrange a shared shuttle to and/or from Guatemala City. Shuttles leave at 11 a.m. and 2 p.m., so please plan to land at the airport by noon to ensure enough time to make it through customs. If you chose private shuttle from the airport to Panajachel (100 USD), Doron Yoga and Zen Center will help you arrange a private shuttle to and/or from Guatemala City. Please keep in mind it can take three to five hours to travel to the lake from the airport, and plan to schedule your flight times accordingly. In Tzununa, take a tuk-tuk from the dock to Doron Yoga. All tuk-tuk drivers know where they are. The rest of the payment should be paid 45 days before arrival. Doron Yoga is devoted to guiding people into total health and happiness through holistic yoga through various retreats, workshops, and training in Guatemala.